His Wife Dumped Him And Left Him Nothing But His Dog. So He Started This Fun Photo Series! On my thirtieth birthday, my wife left me. She took her cookware, furniture, photos, her decorations. She left me alone in an empty all-white apartment. The only thing she didn’t take was my bull terrier, whom she’d named after her favorite shoe designer: Jimmy Choo. With only Jimmy for company, I found inspiration in my blank walls and my best friend and started snapping photos of Jimmy Choo as he trotted and cavorted around the house in glee. When Jimmy collapsed in happy exhaustion next to the white wall, I grabbed a marker and drew a new world around his ginger-eared pup. Suddenly, I felt his long-dormant inspiration for drawing, for art, for life—returning. 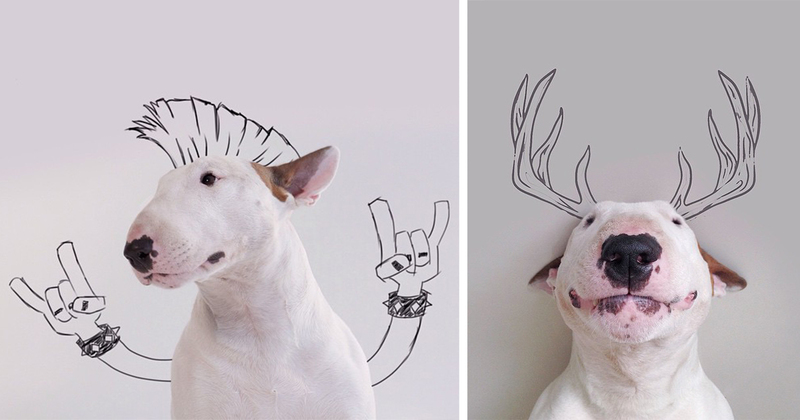 I created a series of fun, tongue-in-cheek illustrations, portraying my bull terrier dreaming of shoes, relaxing on a sofa with a martini by his side or turning canine DJ on the decks. Set against a matte white background, the illustrations are humorous and eye-catching juxtaposed with bright pops of iridescent color in hot pink, copper and electric blue. I added the best pictures of Jimmy to one book, which is coming on October.